I've been watching a lot of movies lately, but haven't had time to write any reviews about them. 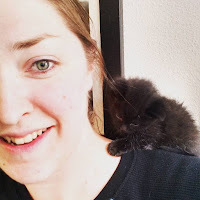 There is always something more important that takes up my time (Like writing a sequel to Hunter.) This week I have several cool movies for you to fill your TV watching time. 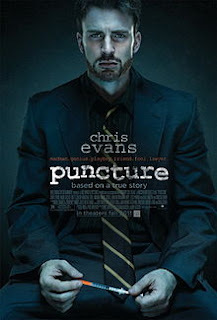 Puncture (2011) - As another movie on my Chris Evans movie list, this was one of the better ones. Its about a lawyer who takes on the medical industry and all their bull. When a nurse gets stuck with an infected needle and dies of aids, Evans' character takes on the huge task of making the medical supply companies (Who have a monopoly) pay for their negligence. There is a safety needle that could save thousands of nurses lives but they wont sell it. Its a sad movie that is based on a true story and you learn a lot about how plastic needles started the aids epidemic. See the trailer here. I'm going to give this movie a four out of five stars because it was super sad but an awesome watch. The movie follows the president and his secret service agent. 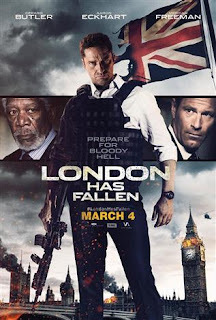 They go to London for a funeral but are attacked by some gun running extremists. The whole movie is spent with Gerard Butler kicking as and taking names, saving the president over and over and over and over again. They blow stuff up, have epic gun battles and the hand to hand combat is awesome. The only down side is all the gore. lot of people get stabbed and blown up and if you can't handle it, then don't watch this movie. Check out the trailer here. This movie has earned an epic four out of five stars for action and awesomeness. 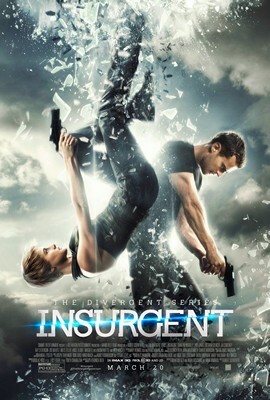 Insurgent (2015) - I've read all the books in this series and I love when the movies are just about as good as the reads. Throughout the entire movie you just want some of the character to die. They are that evil, but the kind of evil that makes sense. Not this evil that you wonder why anyone would put them in the movie. The plot follows Tris and Four as they escape the big city and ultimately break back in to unlock the secrets of the Divergent. There wasn't as much fun play in this movie as the last. No awesome capture the flag or tattoos, but there is a lot of simulations and gun battles. I will watch this movie again so that is why I'm giving it a four out of five stars. 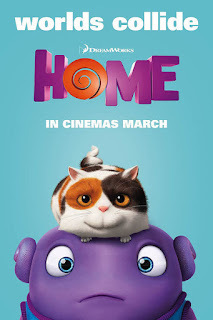 Home (2015) - Every once and a while my kinds request a movie and this was one of them. It looked hilarious, even before my son asked to watch it and it made the whole family gather on the couch for a night of family bonding. The movie is all about this alien race who are masters at running away. They are being pursued by a crazy looking race that they stole something from, and every time they are found, they run away and leave the world they've been hiding on to be destroyed. Of course they come to earth and all hell breaks loose, but everything turns out ok in the end. My favorite part is Pig the cat of course and you can see him in the trailer here. This movie is getting a five out of five for spectacular humor and Pig the Cat. These are my movie picks of the month. I hope you enjoy them as much as my family and I have. If you have a movie you think I would enjoy, please leave me a comment.